Makita DHR202 DHR202Z 18V LXT Hammer Drill +1 BL1830 Battery + DC18RC + LXT400. Makita DHR202 DHR202Z 18V LXT Hammer Drill with LXT400 tool bag 1 BL1830 battery and DC18RC charger. 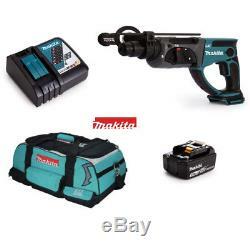 THIS LISTING IS FOR DHR202 and 1 BL1830 Battery plus a Makita LXT400 4 tool kit bag and DC18RC Charger. Multi-Function Cordless SDS Drills From Makita. This 3-function SDS+ hammer drill, with a compact design, provides powerful drilling and chiselling in one machine and, being cordless, gives freedom to the user. With a choice of rotary hammer, hammer only and rotary only, you have everything required for fixing and installation operations. With 2 Joules of impact energy (drilling 20mm in concrete, 26mm in timber and 13mm in steel), this tool has up to 4,000 impacts per minute available and a no-load maximum speed of 0-1100 rpm. A torque limiter is incorporated that instantly disengages the drive should the bit snag, this protects both the drill and the operator. A modern ergonomic design, with anti-vibration side handle and rubberised handgrip surface, provides both positive control, comfortable operation and reduces vibration risk for the operator. Rotation only, hammering with rotation or hammering only. 2 Joules of impact energy, torque limiter for safety. Variable speed trigger and LED job light. Chisel rotates 360° with 40 different positions to get the best working position. Part of Makita 18V Li-Ion family. Impact Rate 0 - 4,000bpm. We are a family owned business supplying hand and power tools since 1983. Our reputation has been built on distributing products at a fair price backed up by an after sales service second to none. Our specialty is in separating manufacturers multi kits, creating our own and offering the items at preferential rates. The carrier will attempt 2 deliveries. In this instance a redelivery charge will apply. Please note we do not make deliveries to PO Boxes. Our carrier aims to deliver within 24 - 48 hours within the UK. Our European deliveries depend on the location and can take between 2 - 5 days from the point of despatch to be delivered depending on the town and country. Items no longer wanted, it is your responsibility to post the item back to us, in new, unused and resalable condition. Incorrect item Received We have strict control and checking procedures operating in our warehouse so it is extremely unlikely that an error will occur. However, sometime mistakes can still be made. If this happens we will collect and redeliver a replacement item as soon as possible and this will obviously be at no cost to you. Get all the latest News, Updates and Special Offers about our Shop. The item "Makita DHR202 DHR202Z 18V LXT Hammer Drill +1 BL1830 Battery + DC18RC + LXT400" is in sale since Friday, January 26, 2018. This item is in the category "Business, Office & Industrial\Power Tools\Saws\Saws\Jig Saws".2007" and is located in London. This item can be shipped worldwide.